brain trauma caused by the sport can no longer be ignored Muhammad Ali has come to exemplify the traumatic brain injury brought on by a game in which the goal is to render one’s opponent unconscious, or at least knock him down with enough force that he is unable to stand up. 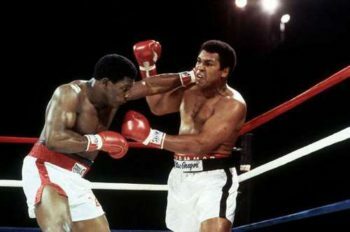 Despite Ali’s remarkable ability to absorb blows, the repeated, brain-addling blows to the head he received over the course of his twenty year career and sixty one fights number in the tens of thousands. 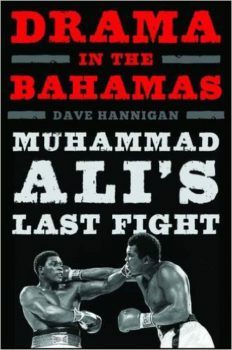 The book starts out with Ali’s loss in 1980 to Larry Holmes. At 38, he had grown soft, and was already showing signs of Parkinson’s Syndrome (different from Parkinson’s Disease but still diminishing to motor-function) and what is broadly classified as Dementia Pugilistica. He frequently slurred his speech, his movements were slower – this lean machine who averaged around 215 pounds in his prime was into the mid 230s. The fight was a devastating spectacle. Ali moved as if in slow motion, his punches lacking all their previous power. The speed and reflexes that, more than anything, had made him a great fighter had vanished. In the words of Mark Kram, Ali had fallen to “embodying the remains of a will never before seen in the ring, a will that had carried himself so far – and now surely too far.” Ali lost by a TKO when his trainer, Angelo Dundee, refused to let his fighter answer the bell for the eleventh round. Even the World Boxing Commission wanted him to stop fighting, going so far as attempting to revoke his fighting license in Nevada and New York. Even England refused to sanction another Ali fight as the British Boxing Board did not want one of its fighters to face the washed up ex-champ. But Ali wanted a rematch. “I’m a long way from a shambling wreck,” he told the BBC before delivering a poem in the form of a challenge to Holmes that we will never hear as it was so slurred that the BBC opted not to air it. The book drives the message home, in no uncertain terms, how badly the public were ready for an Ali retirement – sportscasters, writers, friends, even his wife pleaded with him both publicly and privately to call it quits. For fear of being party to what would surely be the his final downfall, no promoter wanted any part of the spent fighter. Then a Muslim by the name of James X Cornelius stepped in. His resume was not impressive: complete unfamiliarity with the fight game and deep in debt to boot with the reputation of an untrustworthy charlatan with an FBI warrant out for his arrest. But he was certain he could make the fight happen in the newly sovereign islands of the Bahamas. The fighter chosen as Ali’s opponent was Trevor Berbick, a Jamaican who came to America by way of U.S. employment on the military base at Guantanamo Bay. Details of his childhood, including his year of birth, are murky. We do know he was a deeply religious man who claimed to have had “visions” by the age of sixteen, preferring to return to his room after fights to settle in with his bible than to celebrate with the usual misbehaving. He learned to box in Cuba and had his first professional fight in 1976, The manager Doc Kerr could see through his powder puff punching and poor form and groomed him through the ranks to become the Canadian heavyweight champion. Upon his victory against John Tate as an undercard for the first Leonard-Duran match in 1980, he took a page from Ali’s book upon his victory, parading around the ring and demanding a shot at Holmes (who beat him in a unanimous decision a year and a half later). Still, Berbick had garnered enough credibility that Cornelius was able to orchestrate a fight with Ali in Nassau, Bahamas set for December 11, 1981, exactly eight months after Berbick’s defeat by Holmes, and fifteen months after Ali’s. In comparing the two fighters, it should come as no surprise that Hannigan instills little menace in either. If Berbick was more or less a lucky tomato can, Ali wasn’t much better at this point. If Berbick was more or less a lucky tomato can, Ali wasn’t much better at this point. early as 1970 his long-time doctor Ferdie Pacheco was injecting Ali’s hands with cortisone and Xylacene before fights to dull the pain, and by 1977, could not condone sending the fighter back into the ring. After Ali’s fight with Earnie Shavers, Pacheco said of the bout “He won the fight, but his kidneys lost the decision.” When Ali asked him a year later why he said he was “all washed up,” Pacheco replied “I don’t. What I do say is you should not be fighting,” adding portentously to the promoter Bob Arum, “In two or three years we’ll see what the Holmes fight did to his brain and kidneys. That’s when all the scar tissue in the brain will further erode his speech and balance.” X-rays discovered two years after the fact revealed other symptoms, including an enlarged third ventricle. Ali found a new doctor named Harry Demopoulis who would provide him with a glowing bill of health. The setting of the Bahamas did not seem to motivate either fighter. Neither were particularly diligent about training: Ali was down to a third of his usual roadwork and sparring, instead enjoying the lax atmosphere of his camp while the notoriously undisciplined Berbick was referred to more than once by the press as a bum and a tomato can. Despite the idyllic island setting, promotion became a nightmare when Cornelius was unable to come up with the cash for Ali’s advance of a mere $100,000. It was time for Don King to step in, who departed for the Bahamas post haste. The frustration and hesitant support from Ali’s corner can be positively painful to read about. Angelo Dundee, out of fealty or nostalgia (who can say?) believed that, while his legwork was gone and Ali was “only half of what he used to be… half is good enough to beat Berbick.” He added that money held no interest to the fighter. This was his way of erasing the terrible specter of the Holmes fight that continued to haunt him. 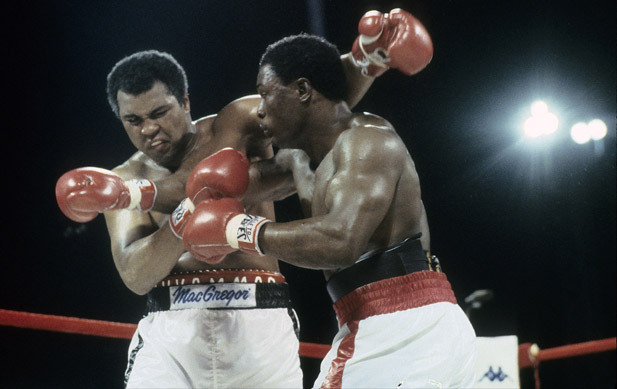 Dubbed by Bert Sugar as “The Trauma in the Bahamas,” the fight was fast approaching, and Ali began using Thomas Hearns (one of the undercards) as a sparring partner. Hearns spoke with guarded confidence of Ali’s abilities, though other attendees of the sessions were less generous. A wag from NBC quipped, “He floated like an anchor and stung like a moth”; a reporter from the Montreal Gazette described his coverage as a “death watch”; Ray Arcel called it “a damn shame”, promoter Dan Duva referred to it as “a disgrace”; and even Don King said “As a fan and a friend, I’d rather he didn’t [fight].” The two fighters, however, saw it as a win-win prospect. Berbick believed that, win or lose, the fight would elevate his status and credibly with the boxing world. Ali, meandering in non-sequiturs during press conferences, generally concluded with a declaration that the fight was a means of paying homage to Allah. Cornelius found help from a wealthy American backer with deep ties to the Bahamas through a proposed casino and a lucrative money-laundering scheme named Victor Sayyah to put up the $450,000 he believed was sufficient to move forward without King’s intervention. But as fight day arrived, Berbick was still owed his money, as were judges who flew to the Bahamas on their own dime. The fighters, including the undercards, expressed outrage over the organizers’ failure to attend to the most basic aspects of preparation. They’d neglected to provide new gloves for the fighters and, having forgotten to acquire a bell, stole one off a nearby cow. This was an admission of the diminishing skills all fighters experience, not an acknowledgenmnt of anything else being wrong. When Berbick was chewed up and spit out by a young Mike Tyson in 1996, he too had already begun showing signs of brain damage. He’d become erratic, fabricating bizarre and highly improbably excuses for his losses and contriving outlandish conspiracies against him. Turning to crime, including sexual battery, housebreaking, and larceny, he was summarily deported back to Jamaica where soon he was again back on the lam. The story reads like a coda – which in a sense it is – not only to a great career and captivating personality, but to a time that served as a kind of wake-up call to the public. Like the recent Blood Brothers: The Fatal Friendship Between Muhammad Ali and Malcolm X by Randy Roberts and Johnny Smith, Hannigan’s book is exhaustive in its research, providing a narrative of a later chapter in the life of this twentieth century icon. Unfortunately, with Ali’s passing last June, it will be a hard sell to the casual fan who wants action, trash talk, and courageous stories of standing up to the system and who will probably grab more fawning reads such as David Remnick’s biography, Life Magazine tributes, or Joyce Carol Oates essays instead of facing the hard truths about how their favorite athlete arrived at the state in which he lived out his remaining thirty two years. But to anyone truly interested in the darker chapters of Ali’s life and the dangerous nature of his chosen field, it is essential reading.